Perfectly hides flaws, not your skin! With Chamomile essence, Royal jelly and Vit. E.
Specially developed to suit Asian women's skin, Maybelline invents Angelfit. Super blendable formula without clogging pores. A natural luminous finish that perfectly fits your skin tone. Non-comedogenic, Dermatogically Tested. WEIGHT : 18 ml / 0.6 oz. SHADES: Available in more than 3 shades. 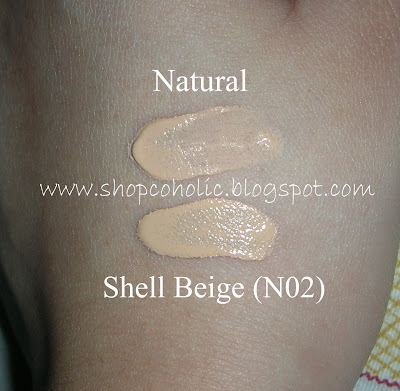 My shade is N02 (Shell beige), MAC NC20-25 for reference. * specifically developed for us Asians! Yey for that! * product holds only 18ml compared to Clear Smooth gel which is 30ml. I prefer to use this with a damp sponge or foundation brush. Set with loose powder. This foundation is quite sheer but evens out my skintone, for a medium coverage set the foundation with loose powder using a puff and gently press the powder onto your skin. 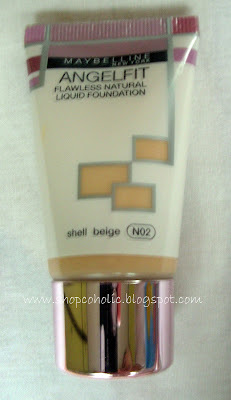 If you want a heavier coverage layer with mineral foundation. I prefer to apply loose powder first before applying mineral foundation on my face, so that the foundation glides smoothly on my skin. If you want a dewy look, use a damp sponge in applying. Use a large powder brush to apply a sheer layer of powder for a long lasting finish(optional). Will i repurchase? Yes! Yes! But i wanna try first their Clear Smooth Minerals Liquid foundation SPF 18 in N02 to see which of the two variants suit me. i've always wanted to try Angelfit foundie. I guess I'm gonna buy one when I finish the bottle of my current foundation. lightest ever!!! just tried this one and i can't believe what i'm missing! whoaaaa... props for Maybelline!!! oh by the way, its me sis... MyMaria here.. :)) was logged on to a different google account! I just fell in love with Maybelline all over again! FAKE MAC Cosmetics on Ebay Ph!